Zlatan Ibrahimovic, Edinson Cavani and Angel Di Maria scored as Paris St-Germain came from behind to beat Nantes and maintain their unbeaten start. 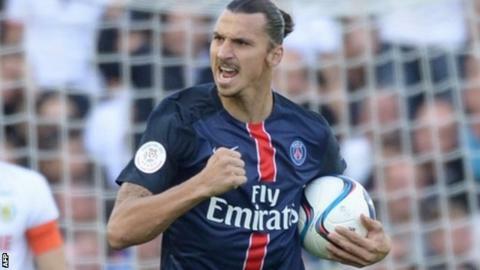 Ibrahimovic struck after 48 minutes to cancel out a first-half header from midfielder Yacine Bammou. Cavani headed home a Di Maria free-kick on 73 minutes, before the Argentina midfielder chipped the third from a Javier Pastore pass. Serge Aurier's 90th-minute goal sealed the win that keeps PSG top of Ligue 1. Bammou also struck the post for Nantes, who slid to a fourth straight defeat. Paris travel to Ukraine to face Shakhtar Donetsk in the Champions League on Wednesday, before hosting Marseille in the league next Sunday. Lyon, last season's runners-up, trail PSG by eight points after suffering a 3-1 defeat at mid-table Bordeaux. Former Arsenal defender Sebastien Squillaci scored twice as Bastia won 3-0 against Toulouse, while top-flight newcomers GFC Ajaccio are still searching for their first win after losing 2-0 at Caen. Match ends, Nantes 1, Paris Saint-Germain 4. Second Half ends, Nantes 1, Paris Saint-Germain 4. Goal! Nantes 1, Paris Saint-Germain 4. Serge Aurier (Paris Saint-Germain) right footed shot from the centre of the box to the bottom right corner. Assisted by Javier Pastore with a cross following a corner. Corner, Paris Saint-Germain. Conceded by Ermir Lenjani. Attempt saved. Ezequiel Lavezzi (Paris Saint-Germain) right footed shot from the left side of the box is saved in the bottom right corner. Assisted by Javier Pastore. Edinson Cavani (Paris Saint-Germain) wins a free kick in the defensive half. Foul by Léo Dubois (Nantes). Marco Verratti (Paris Saint-Germain) wins a free kick in the attacking half. Foul by Johan Audel (Nantes). Foul by Adrien Thomasson (Nantes). Substitution, Paris Saint-Germain. Ezequiel Lavezzi replaces Ángel Di María. Foul by Alejandro Bedoya (Nantes). Goal! Nantes 1, Paris Saint-Germain 3. Ángel Di María (Paris Saint-Germain) left footed shot from outside the box to the high centre of the goal. Assisted by Javier Pastore with a through ball. Substitution, Nantes. Johan Audel replaces Yacine Bammou. Corner, Nantes. Conceded by Layvin Kurzawa. Adrien Thomasson (Nantes) wins a free kick in the defensive half. Goal! Nantes 1, Paris Saint-Germain 2. Edinson Cavani (Paris Saint-Germain) header from the centre of the box to the high centre of the goal. Assisted by Ángel Di María with a cross following a set piece situation. Hand ball by Ermir Lenjani (Nantes). Attempt missed. Zlatan Ibrahimovic (Paris Saint-Germain) header from the centre of the box is high and wide to the left. Assisted by Ángel Di María with a cross. Oswaldo Vizcarrondo (Nantes) is shown the yellow card. Zlatan Ibrahimovic (Paris Saint-Germain) wins a free kick in the defensive half. Foul by Oswaldo Vizcarrondo (Nantes). Substitution, Nantes. Adrien Thomasson replaces Wilfried Moimbé. Zlatan Ibrahimovic (Paris Saint-Germain) is shown the yellow card for a bad foul. Lorik Cana (Nantes) wins a free kick in the defensive half. Hand ball by Zlatan Ibrahimovic (Paris Saint-Germain). Substitution, Paris Saint-Germain. Thiago Motta replaces Benjamin Stambouli. Layvin Kurzawa (Paris Saint-Germain) wins a free kick in the defensive half. Attempt missed. Ángel Di María (Paris Saint-Germain) left footed shot from the left side of the box misses to the left. Assisted by Javier Pastore. Attempt blocked. Yacine Bammou (Nantes) left footed shot from the left side of the box is blocked.